During the 2010 European tour of a world-famous female singer, it was difficult for her to stay in tune or have good tone, much less sing the full range of most of her own songs. This was because her voice had not been cared for properly. You might not immediately associate proper diet, good sleep and adequate exercise with memorable performances, but proper care is integral to the quality and stamina of your voice and the longevity of your career. With the success of your career and your happiness dependent on your vocal performance, consistent preventative care takes on new meaning and becomes an indispensable activity. To respond well all muscles should be limbered before vigorous use. 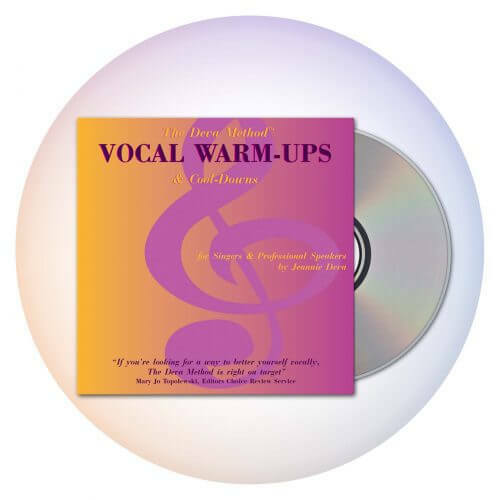 Vocal warm-ups are essentially voice muscle limbering exercises. They don’t use loud volume, nor are they done in a whisper. Many singers use their first couple of songs as a warm-up. Songs are not good warm-ups because they require many different complex movements of your vocal musculature. Your voice should be warmed-up before such demand is placed on it. And frankly, if your vocal technique is not adequate to support all the different requirements of a song, using songs as a warm-up might actually end up fatiguing the muscles and subtracting from your tonal palette. Through correct techniques and exercises you can achieve vocal strength, stamina, flexibility, resonance, range, consistency, tone, and accurate pitch in an effortlessly blended, emotionally sensitive voice that’s uniquely yours. 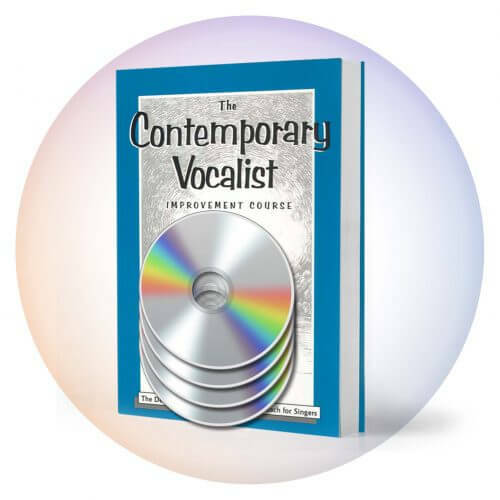 You can find a complete series of techniques in my Contemporary Vocalist: Volumes One and Two. This resource will provide you with the knowledge and exercises to build this important pillar. When you sing, the sounds of your voice are produced from the rapid and highly precise actions of small internal muscles. As with any type of demanding physical activity, circulation increases and the muscles swell with blood. Blood supplies all the cells in the body with three essentials for life: oxygen, nutrients and water. It also performs another vital function; it removes waste products from the cells after they convert these three essentials into energy. This is also true of the vocal muscles, and especially when engaged in a rigorous activity such as singing. If you don’t use cool-downs to return your voice to its normal speaking condition, even though your voice training and technique may be excellent, you could experience vocal fatigue and huskiness for one to three days after an intense vocal performance. On The Deva Method Vocal Warm-Ups and Cool-Downs CD, you’ll find a number of easy-to-use exercises — including a singer’s massage — that you can customize to your needs. There are certain substances that can be harmful to the sensitive mucous membranes of the throat and vocal folds. Recreational drugs such as marijuana, the nicotine and chemicals in cigarettes, as well as alcoholic beverages are poisons with adverse side effects that can affect the tone and function of the voice. Elimination of harmful and abusive substances can make a big improvement in your perceptual sensitivity as well as the quality of your voice. I’m not a nutritionist, but many years of experience with numerous diets and thousands of singers have brought to light which foods are beneficial and which are detrimental to the voice. The “foods to avoid” list for singers would be those that stiffen muscles or stimulate phlegm and mucous production in the body and particularly in the vocal folds. 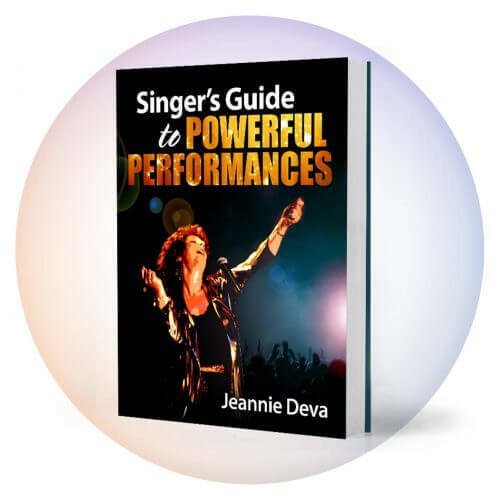 You’ll find the best foods and drinks as well as which foods and beverages to avoid and more, in my comprehensive Singer’s Guide to Powerful Performances digital eBook. To maintain muscle tone and organ function, regular exercise, including aerobic and weight resistance is recommended. Since singing and performing are physically demanding, routine exercise is essential. If you move around a lot on stage, or wish to, conditioning your body and your breathing is vital. This will make possible feeling more comfortable without getting out of breath if you want to dance or move freely on stage. Your body and your voice need rest in order to function at their best. Since your voice is generated by muscle action — like any muscle in your body — when you sing with a tired body and fatigued muscles, you’ll generally use excessive effort to accomplish what a rested body would do more easily. Effort generates strain and tension, which, besides distracting from the quality of the performance, may lead to vocal blowout. Your voice is affected by your state of mind and your emotions, particularly if you tend to bottle up your feelings and don’t allow them to flow out into sound production. Chances are you’ve noticed that it’s more difficult to sing when you’re distraught than when you’re happy and at ease. While we certainly cannot control everything that happens, we can influence events in either a positive or negative way. Treating others in a friendly, respectful and considerate manner is good advice for anyone, but it is particularly important for a performer. You have chosen a profession that requires people skills. You will have to work with producers, agents, promoters, managers, radio interviewers and sound engineers, and they will each have the ability to lift your career or impede it. You’ll find that the more you improve your communication skills, the more harmonious your relationships with others and the greater percentage of successful outcome you’ll enjoy. This success brings about a happier state of mind, which results in an upward spiral into an even higher quality of life. May you be empowered with this information and be the singer you want to be!